Grange Lido built in 1932, is a rare example of beautiful Art Deco swimming pool complex situated in a spectacular position in the Southern Lake District, overlooking Morecambe Bay. It is the only seaside lido in the north of England and as an important piece of heritage it is grade 2 listed. A garden in amongst gardens! The Lido was closed by the council 25 years ago and since then it has fallen into a state of disrepair and is being threatened with being filled in and made into a garden. It is already situated amongst pleasant gardens on Grange promenade. The Lido is much loved locally and by visitors from across the country. The Save Grange Lido group started with a facebook page and has now grown into a website, online shop and fundraiser to meet the costs of engineers and architects and other costs of proposing real plans to transform the Lido into a viable asset and leisure facility at the heart of the community and a gem in the crown of South Lakeland. Save Grange Lido believes that the council should be working to have it restored and should stop wasting public money promoting a scheme to have it filled in. The plan includes the restoration of the 50m six lane pool, a heated 25m pool alongside a paddling and play pool. The complex would also boast a community space, restaurant, sauna, steam room and shop. The plans proposed by the Save Grange Lido group have been based on careful research, financial data and copy business plans from a number of successfully operating Lidos like the Jubilee Pool in Penzance, Portishead Lido, Saltdean Lido, Faversham Pools, Thames Lido in Reading, Lido Ponty in Wales and Stonehaven in Scotland. 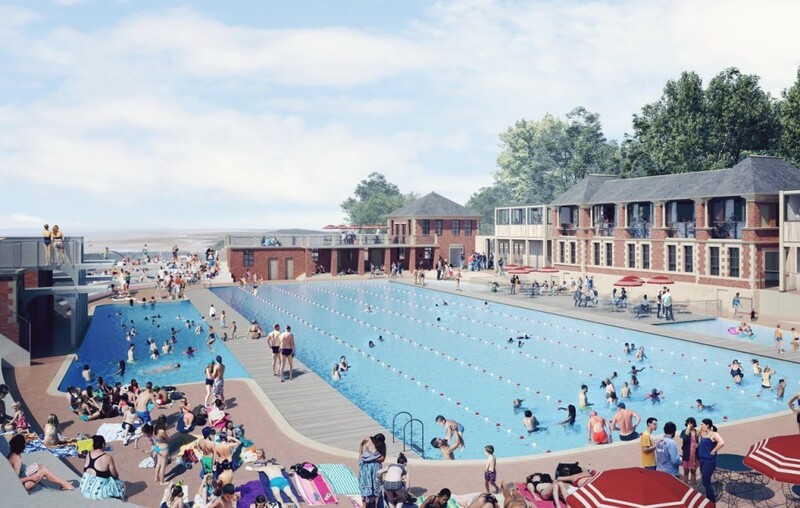 It will be an absolute travesty if this historic lido is anything but restored to include a pool and to propose to fill it in at at time when lidos and swimming outdoors is going through a growth period is at best short-sighted and criminal. You can visit the save grange lido website here. South Lake District Council are still planning to fill it in. Please come along to the Council meeting at Kendal Town Hall on Wednesday 23rd Jan at 10.00 am to show your opposition to the Council’s plans for an ornamental garden and support for a thriving Lido.